I used to regularly write posts on “honest trucks” for Barn Finds but those have been hard to come by recently. 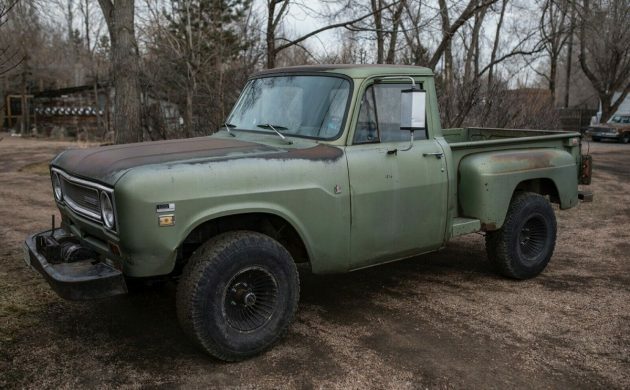 Thankfully the trend has been reversed with this 1971 International Harvester “step side” truck that has been listed for sale here on eBay. 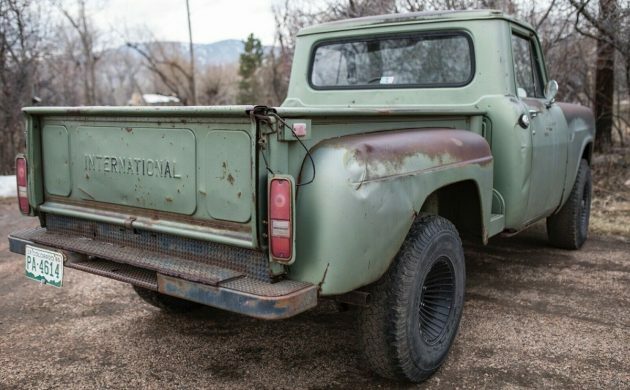 The truck is currently located in Boulder, Colorado and bidding is up to $3,600 with no reserve. What do I mean by “honest” truck? 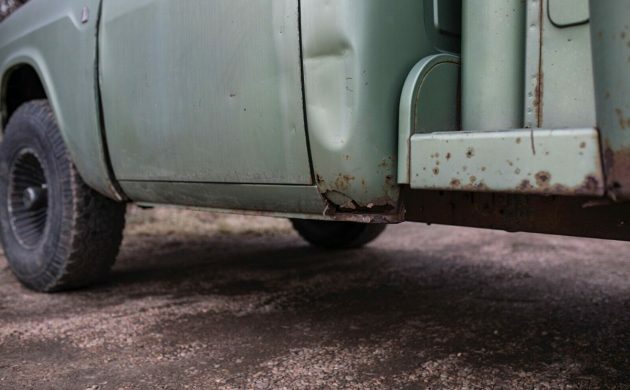 One that isn’t hiding any major defects, wears it’s scars of use proudly and can be used for real truck stuff without worry of denting the bed or scratching the paint — not that it won’t happen, but more that it doesn’t matter or affect the vehicle’s value. As you can see from the picture above, this truck has plenty of character. 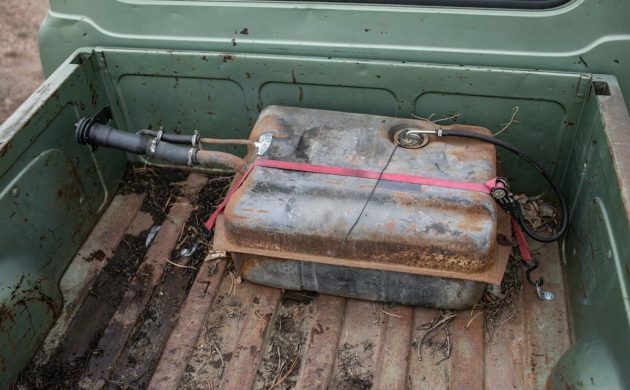 It also has a need for a replacement fuel tank as this is a Chevrolet tank temporarily strapped in the bed. I found tanks a couple of places for around $350, but you’ll need a sending unit as well. The 1110 model featured a solid front axle and either a 1600 or 2200 pound payload rating, depending on which suspension package was selected. You’ll also need some sheet metal to patch the floor with. There are a couple of places like this on the truck. You can get a whole line of patch panels here amongst other suppliers. As you can see, there’s some rust repair needed here too. 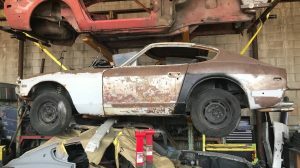 Possibly of more concern is the missing front driveshaft; the seller says they have not tried to engage the PT to the front so there may be issues there as well. 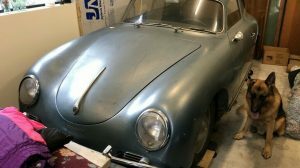 The seller also mentions shifter, brake, tire and exhaust issues that will need to be addressed by the purchaser. An early version of a rear anti-lock braking system called Adaptive Braking was manufactured by Bendix for International for these trucks in late 1971, but the option was not popular due to its high cost. We don’t know if this truck has it or not. According to vinwiz.com this truck was produced in Springfield, Ohio. 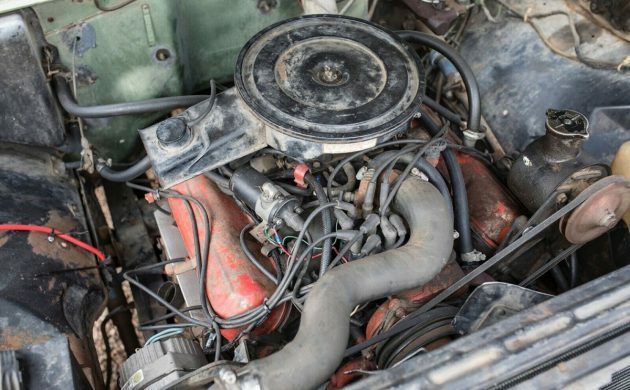 While there were four different versions of the International V8 offered in the 1971 1100 line, the original 304 cubic inch V8 has been replaced with a 1979 IH Scout 345 cubic inch V8 as well as the four-speed transmission from the same vehicle. We’re told it runs very well. So what do you think of this honest truck? Ready to go bring it home? Would love to see this on the road in a salt-free state! I’m surprised it got this rusty in Colorado. Of that doesn’t mean that she’s lived there her whole life. For the work that needs to be done yet I’m a little concerned about the bid going up like it has. Could end up being unobtainable for more than a few Binder aficionados. Still love the stepside configuration! If you look carefully, there isn’t much rust. Rockers are solid. The rust came from dripping rain under the rubber floor mat, and moisture laying in the rear cab corners where dirt collects. Got a “Corn Binder” thing going, love it! If the previous truck got you thrilled, like me, this is better yet. I won’t repeat all I said about the last IH, but this, being a 4×4 and stepside, makes it even more rare than the other one. 4×4’s are king out here, and it doesn’t surprise me to see this from Colorado. To clear up a common misconception, Colorado is NOT a “rust free” state. Colorado does indeed use salt, or liquid calcium chloride, on main roads, much to the dismay of all the tree huggers here. 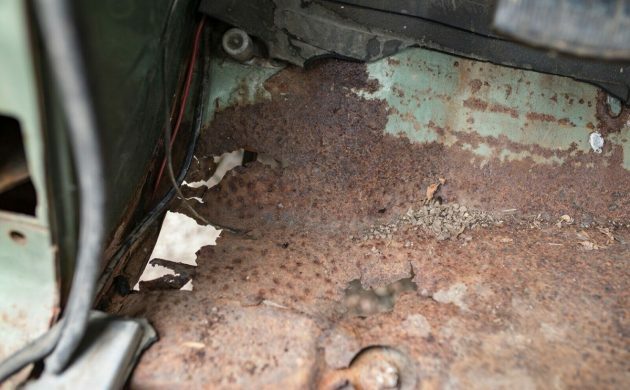 It’s considered a step backward for those folks, but Colorado vehicles do indeed have rust, like shown here, just not the catastrophic results of the midwest, where these literally evaporated. Great find, you want a tough 4×4 truck, you can’t go wrong here and with only one bid and no interest, this could easily be yours. With that gas tank in the bed I’d feel like an honest to goodness hillbilly! 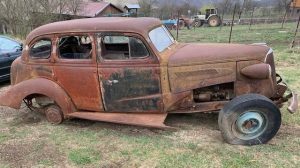 Only lived in Colorado for a year many decades ago but the cars I owned there, including a ’47 DeSoto, a ’60 Buick limo and a couple of 5 window Chevy trucks, had zero rust in them. Strange. Bu if I lived up in the mountains west of Denver today this would be perfect for the winters. I think the salt application is kind of a recent thing. I live SW of Denver in the mountains, and only the main highways ( all 3 of them) get treated. City and county roads do not. Unlike most cars, something like this, is bound to be used in the snow, and even one application of salt, they must have made trips to Denver with this, or down a main highway, and that’s all it takes. Also, I believe high humidity has a lot to do with rusting. It’s so freakin’ dry here, we have single digit dew points. That helps preserve metal too. Got a 1210 4×4 that used to be a spray rig in inventory. Rust is so bad it will soon be a roadster as the roof above the windshield is about to let go.Hope this one isn’t going the same route. body and interior needed a lot of work. a lot of newspapers with it! I honestly don’t think I’ve ever seen a stepside version of this truck before. 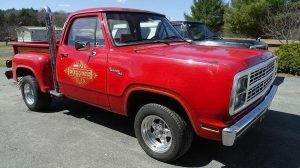 Awesome truck if all the parts are there I would love to restore it with a fresh new paint job and new material on the bench seat!! It would be a classic ride!! Better have the build sheet, might be multiple front driveshafts for that one. I had a 74 3/4 ton 4×4. In 79 i ordered the front driveshaft October 1st and got it on April 12th made to order!